Birmingham will host its first OpenCo event on Thursday 2nd October with five different sites across the city opening their doors to senior marketers, investors, developers, writers, technologists, start up founders, and policy makers. We’re thrilled to announce that we’re now an award-winning team! Our project work on the Library of Birmingham has been recognized and celebrated through winning the 2014 EMEA InAVation award for best Public Sector/ Government Facility. 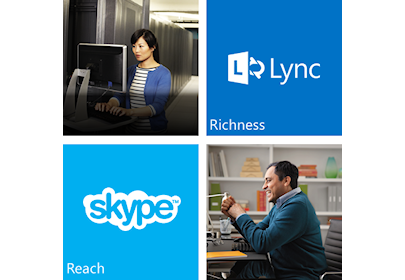 The enterprise richness of Lync, now with the global reach of Skype. Have you got Microsoft Lync? Microsoft has now announced the new Lync-Skype connectivity for Lync customers around the world. Enabling Lync and Skype to connect to one another has many advantages to how you could work. This combination now allows you to connect and collaborate with suppliers, customers, and partners all around the globe ‘from the living room to the boardroom’. Don’t forget the exciting potential of integrating your physical meeting spaces with Lync too using Visual Collaboration, turning UC (Unified Communications) in to Unified Communication and Collaboration. Read more and get SkypeLyncing! Have you ever had a time where you need to use a room for an urgent meeting but you are not sure which rooms are available? Checking availability might involve going through a long manual procedure to find the available room. AMX introduces Modero X series panel with small LED on each side that glows green if the room is available and red if it’s booked. Read through this article to find out more and how it could change the way you find your available rooms and don’t forget, we can do an excellent job of integrating resource scheduling software such as the excellent EMS from DEA (www.dea.com) to make the experience even better! We are shaping the future of business while we grow as a company ourselves, taking advantage of the latest technology developments. Our project work is focused on the user experience and we’re always striving to improve business productivity through collaboration and technology that will last well in to the future. Have a look at Jacobs Morgan’s suggestions on what will the future look like. What should it look like? And how can technology be used better? It’s a great question – did you know that there are very few Individuals in the 18-24 age range working in the AV world? (See: http://bit.ly/12m0QM3) We’re a bit worried about this so we’re already working with local universities to help develop the next generation of AV and IT engineers. We’ve already had our first talented graduate from Aston University who we’re developing in to a business leader of tomorrow. Did you know two of our employees are STEM ambassadors too? They are often out and about, very much representing the ‘T’ (Technology) and the ‘E’ (Engineering) to inspire even younger people to join us in their careers.